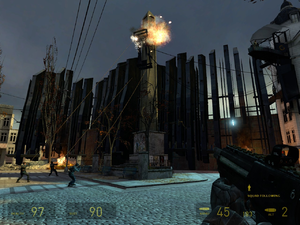 Welcome to Anticitizen One, the eleventh level of Half Life 2. 5 "It's not safe here anymore." 6 "Now we can join up with Barney." Dog is a very useful ally. On the concrete ledge after the drop. Hop out of the lift shaft and Dog will follow. Go out of the hole in the wall, climb onto one of the green dumpsters to your right, pull up a crate and use it to get onto the concrete ledge for a lambda locator. 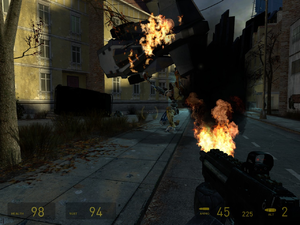 Jump down and as you approach the van blocking the road some Combine will shoot at you, but Dog will pick up the van and throw it at them, clearing the way for you to proceed. 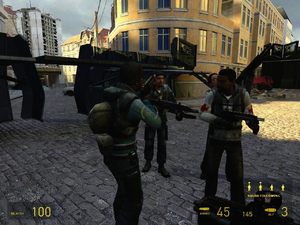 Carry on down the road and when it meets another coming from the right, Dog will run towards the Combine barricade, but will turn around as an APC starts firing at him. He'll jump on it and ride it around a bit before picking it up and throwing it into the Combine-occupied corner building. Dog will then go and forcibly open the gate of the barricade; head on through, and he'll be about to join you but a dropship lands nearby. Instead of following you, Dog will close the barricade, kill the soldiers that come out of the APC, then ride the dropship over the mobile Combine wall and out of sight. Look to the left, move quickly to avoid being crushed by the wall and jump over the bent fence. On the other side, go into the building. Through the door to the left is a crouch-space which you will need to go through, but before that you can check the room on the right further along the corridor to find a television, and the source of the weird noise; it's G-Man! He'll be on the screen briefly whilst you look at it, adjust his tie as usual, then turn away and the TV will mysteriously turn itself off. Creepy guy. Head back to the crouch-space and go through to a loading screen. Rebels finally silence the Breencast in City 17's square. Go through the dark corridor and you'll emerge in the playground; it's now in a worse state than it was already in. Help the rebel by killing the Combine scanners, then go to the end of the yard and turn right, left at the corner and past the fence, then left again and under the house that's fallen over. Some rebels will tear down the large "Breencast" screen. The rebels will begin following you and you'll be shown how to use your squad. They're useful for following you, opening things and drawing fire away from you so you can do what you need to do. Send and recall your squad and the Combine gate to the right of the Breencast tower will open and two CPs will come out. They'll go down pretty quickly, so head through the alley they came from and up the stairs at the end to get another loading screen. Around the corner, you'll see a rebel on the other side of the fence, beyond a hole covered by a metal plate. 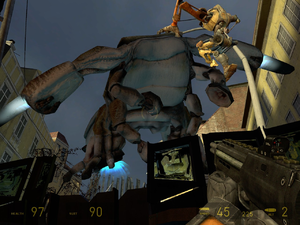 He'll warn you about all the hopper mines; these things are anchored to the ground but when you go near them they'll jump out and explode. If you keep your wits about you it's only ever your squad who will cop it from these, and you can wrench them out of the ground with your gravity gun to use them yourself. 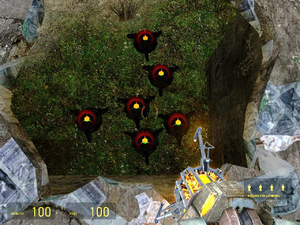 Move the metal plate and use the gravity gun to get rid of the hopper mines beneath the hole, then clear the mines in the yard so your squad can proceed safely. Some headcrabs will approach from the shed up at the top of the stairs; your squad can deal with these. In the shed you'll find some health and suit batteries, and you can watch another Breencast on the TV in here (or alternatively turn the TV off by pulling it out of its plug and smashing it with the crowbar). One of the explosive barrels hides some supplies. Blow up the explosive barrel by the shed. Outside the shed, get rid of the hoppers and go down the alley by the rebel who won't follow you for some more health and AR2 ammo. 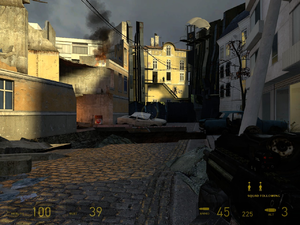 Inside the alley you'll get a medic following you; he's useful, so try and keep him alive. 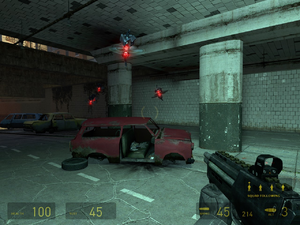 Back outside, there's a strider over the barricade to the right; it'll use its cannon to blow up the car near you. You don't have the means to deal with it so let it pass on down the road over the barricade. Meanwhile, head up the road to the next barricade, watching out for the hoppers that the Combine scanners drop, and the CP in the tower. Once they're all disposed of, kill the headcrabs at the top of the road and go into the alley on the right. There are some hoppers down here, so be careful. In the yard at the end, deal with the CPs in the various windows. 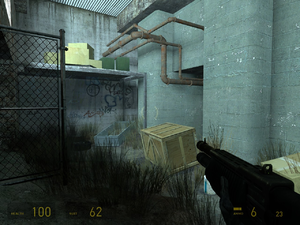 There are some spare hoppers in the shed to your right as well as a medpack for you to use, and if you look at the wall on the left by the closed shed and explosive barrel you'll see another lambda symbol spray painted on the wall. What could this mean? Pull the explosive barrel away and a panel of the shed will fall off, and inside is a cache of grenades and an SMG grenade as well as some suit power and health. Go down the alley steps and in the next yard watch out for the hopper and explosive barrel on the left; fire them down the yard past the railings to take out the group of CPs by the next shed. Once they're disposed of, check the shed for some shotgun ammo and more spare hoppers, then go in the dark doorway in the building nearby past the supply crate. Round the corner for another loading screen. Fight your way through close combat in the buildings. Inside here, you can head up the stairs for a repeat of an earlier Breencast on another TV, kill the zombies and find some magnum ammo. Back at the bottom, head outside and you'll be on another long and broken road up to a Combine barricade. Ignore the strider at the end, it'll move on soon enough; deal with the scanners dropping hoppers first. Go around the concrete in the middle of the road to the medic tending the wounded rebel; wait here for a bit. Soon the wounded guy will die, and the medic will follow you. She's got a shotgun, an improvement over the SMGs all your other guys have, and you'll want as many followers as you can get. You can't proceed past the pulled-up road, so check the dark stairs near where the medic was; down here there's some more stairs to climb on the left, and some supply crates guarded by a headcrab in the basement. Go up the stairs after getting the supplies and go up the next staircase to the second floor. Go through either of the glass double doors on the left and kill the two CPs inside. Head for the explosive barrel. Head down the corridor on the right next where two CPs will be shooting at you. Deal with them (checking the small cloakroom on the right for supply crates containing an SMG grenade and some crossbow bolts) and then go left at the end and follow the path around by the Combine console to the building section with a big hole in the wall. Drop down and take out the two stationary turrets, then smash the glass and go out. Get rid of the explosive barrels and hoppers because a stray Combine shot will detonate them and potentially kill you and your squad with it. Take out some of the CPs on the barricade and push forward to another set of glass windows in a building further along on the right. You can use this to get around the next bit of pulled-up road. Inside, reload, then head straight across the street to the half-destroyed building with a fire and explosive barrel in it. Supplies can be found between two city destroyer walls. Head through and kill the CP, and get rid of the hoppers. Head up the stairs to the room with a giant hole in the floor, and drop down as far as you can go. The door in front of you now leads out to behind the Combine barricade — now that you're here, take out the rest of the CPs. Climb the stairs, press the button to open the gate to let the rebels through and use the health dispenser if you need to. 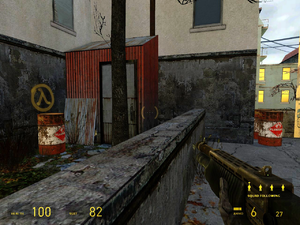 Go up the walkway to the house that some of the metrocops were emerging from before. Kill the two CPs inside the rooms and check the left one for a suit charger. Once you've used it, head left to the staircase. The top door is locked and has a turret guarding it; you can take it out if you want. Otherwise, head down the stairs to the bottom and go through the rooms taking out the CPs. Try to use the SMG as much as possible here as the CPs you are fighting use a lot of them. There's a health dispenser at the bottom of the stairs. 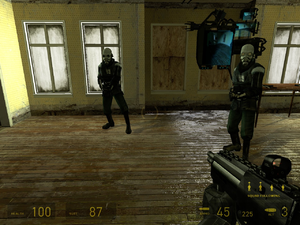 Enter the room and take out the three turrets (2 in front of you, 1 behind you). Drop down the hole, up the stairs and you find yourself in between two city destroyer walls, where you will find a cache. Head back down and this time follow the hallway to a loading screen. The tunnel gets filled with manhacks. Collect the supplies by the bonfire. Go down the stairs at the end and carry on the only way you can. Take out the manhacks and head past the blockage. Climb up onto the end of the fenced area on the left, drop down the side into it, raid the supplies and open the padlocked gate for your comrades. Go through the next room, taking out Combine and manhacks, through the door and immediately right, and double back on yourself in the new area. In the dead end, by the bonfire is a cache. Turn around and continue along the original route through the garage, taking out the Combine and manhacks, and collecting supplies as you go. 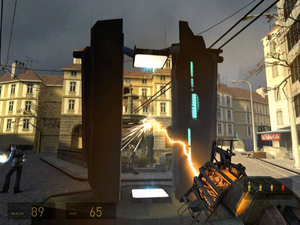 The end of this room is blocked, but through a hole a rebel asks for time to set explosive charges to make a way forward for you. Go back to the mounted gun and shoot the Combine and manhacks before returning to the wall, where there is now a gap for you to pass through. Head for the door on the left to find it's locked and then look for a hole in the wall to crawl through. Your fellow rebels will wait at the gap for you to find a safe way forward. 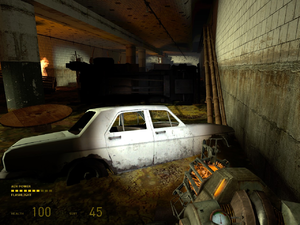 Get through the toxic tunnel under City 17. Take the supplies, make your way past the blockage and towards the far left of the room using your gravity gun, without falling into the radioactive sludge. Deal with the zombies that pop up at various stages. Just past the blue truck on the left, running parallel to the left wall, are some pipes which slope down to a white car. Jump onto these, follow them up and enter any ventilation grille in the wall. Once in the vent shaft drop through any grille in the floor and follow the corridor. Pick up the supplies and head to the next small room. You will hear a rebel ask you to open the door on the left. Do this and then head up the stairs to a loading screen. "It's not safe here anymore." Combine shells deliver fast headcrabs. Grab the supplies just before lowering the bridge. Go outside, deal with the fast headcrabs from the shells being dropped, pick up the suit power and SMG grenade in the blue van and head into the next building. You'll be greeted by a rebel on the other side of a gate. Listen to him, take the supplies and head up the stairs. Kill the headcrab, head through into the next room and continue until you come to the carpeted room. Head into the next room on the right, drop through the hole to the ground floor, take the supplies and go into a room where you will find a couple of rebels taking a breather. Head down the stairs and right, kill the Combine and wait for the door on the right to be opened. Get the supplies in the small side room, head up the stairs, killing the Combine on the way until you come to a room with a hole in the floor. Kill the Combine below and drop down into the passage. The room to the right has some supplies and the room straight ahead is the only way forward. Ramps to a second bridge. A rebel will lower a bridge and invite you across to the next building. Head across, take the supplies in the corner and continue into the hall. Follow the stairs down and at the bottom turn left and climb some different stairs. Kill the headcrabs (fast and normal) and the fast zombie and pop to the bathroom for a medkit. Drop through the hole in the floor of the main room and look out for a fast zombie, which is on fire and jumps up from the room below. Drop through this second hole, kill the zombie below and drop through another hole to the floor below. The stairs up are blocked, so continue on this floor to a room with supplies and fast headcrabs. Head outside and watch out for hopper mines, Combine and grenades. 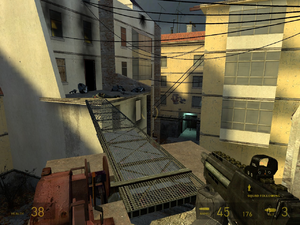 Head up the stairs and into the building, and then use the ramps to get to a supply cache just before another raised bridge. Use the lever to lower the second bridge. Break the crates and pull the supplies through the gate. Go outside, kill the Combine and "use" the lever to lower the bridge. Cross the bridge, kill the Combine, collect the supplies and drop to the lower floor. Continue through the building, killing the Combine and collecting supplies on the way until you come to a blockage. Climb the stairs, kill the barnacle and immediately to your right kill another barnacle and a fast zombie. Drop down the hole in the main room and kill the Combine and fast zombie as you go through the building. Get to the end and drop through another hole. Head down the stairs and straight ahead for another supply cache (on your left in a gated area). Go back into the doorway you entered through and immediately right and up some stairs to a loading screen. "Now we can join up with Barney." Blast the generator when the shields come down. Survive the generator plaza standoff. Follow the only route possible until you drop through another hole in the floor. Take care of any turrets left standing and use the health and suit power dispensers. Alyx will burst through the door and greet you. Listen to her and then work through the building to the next health and suit power dispensers, killing the Combine on the way. Go to the bottom of the stairs, kill the Combine and listen to Alyx. She'll give you instructions and opens a door which leads to your target. Hold off the Combine, and keep restoring your ammo and health as much as possible. Alyx will tell you when the generator's outer shields are down, followed by the inner shields and finally when the core is exposed. When she announces this blast the energy ball with your gravity gun, head through the gates that open and find cover until Alyx closes the gates against the Combine. Alyx will look for a new way forward by climbing a building. Watch her and wait until she identifies your route, then drop into the trench and cross to the other side to find an alley sloping downwards. At the bottom push open the gate for a loading screen. Follow the rusty pipes for your way forward. Get the supplies from behind the rusty pipe. Hop over the motionless valves to find the cache. Use the gravity gun to remove the bar from the doors. 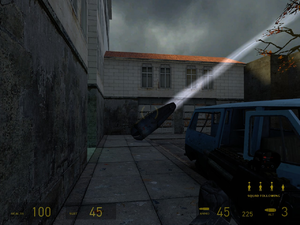 Crouch and use the gravity gun to get the supplies. Jump onto the pipes at the top and up the planks. Follow the walkway behind the red container. Walk along the moving platform's supports. Drop down and open the next gate with your gravity gun. Break through the barrier and deal with the manhacks. Pull the barrels and boxes out of the way and climb the slanted walkway onto the rusty pipes above. Follow the pipes along and into the grille, dealing with the manhacks on the way. Exit through the grille on the other side, drop to the floor and deal with the manhacks. Look on the high ledge directly opposite the grille you came out of for a supply crate. Head along the passage the last manhacks came from for some health and suit power, then return to where you came out of the grille. Follow the route of the rusty pipes to a room on the right. Kill the Combine above, pull the supply crate down from their floor and find the crate on your floor. 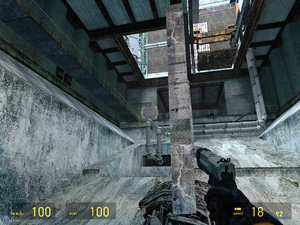 Look to the level immediately below you and kill the zombie. Drop to the zombie's floor and drop another floor, kill the Combine and find the rusty pipe running vertically through the building. On a small level behind it is a supply cache. Carefully find your way to this level, as if you fall lower than where the rusty pipe runs horizontally you will die in a bottomless drop. 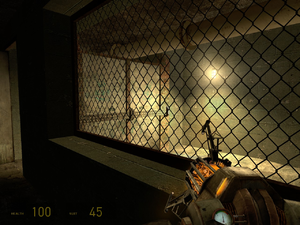 Climb the ladder on the vertical rusty pipe and make your way into a side room and collect the health and suit power, but watch out for the toxic headcrab. Look through the window and use the gravity gun to remove the bar on the double doors to create your exit. Go through the doors and kill the Combine and headcrabs (toxic and normal). Look to the left to see two Combine drop on ziplines and fight the zombies. Let them fight until only zombies or Combine are left and then finish off whatever's left. Follow the passage round to the left and all the way to the end, killing the barnacles and headcrabs on your way. Turn right and immediately right again for some stairs, watching out for the toxic headcrab at the top of these. Climb the stairs and on the left is a recess with a vertical supporting beam, some medkits and some suit power. The beam supports a false ceiling with toxic head crabs that will drop on you if you break the beam... but they're already dead by the time they hit the floor. Go back down the stairs and this time head to your right and deal with the barnacle. Drop to the sand and enter the passage opposite. Go straight through and take out the toxic zombie in the room beyond. Go to the opposite side of the room and follow the long passage to a supply cache marked with a lambda sign. Return along the passage to the two medkits and the other lambda sign. Crouch down here and pop your flashlight on to see all the bounty in the long, narrow recess. Use your gravity gun to get the supplies and go up the slope. Climb up the ladder on the left, follow the route and kill the toxic headcrabs along the way. When you get to the end, follow the fencing along the high ledge, head down the stairs, killing the toxic and other headcrabs, and collecting supplies as you go. Continue forward into a large open room with a concrete ledge sloping upwards. Proceed up the slope, jump onto the pipes at the top and up the planks on the right to the next concrete ledge. Watch out for the hopper. Go to the gangway on your left and start to cross it. As you do, a grenade will drop in front of you. Back up (or sprint and jump) until you are out of range of the explosion and deal with the Combine who dropped it. Go to the red container at the far end on the left, killing the barnacle on the way. Charge your health and suit at the dispensers, and collect the supplies, dealing with the Combine as you go. Pull the lever to summon a moving platform, snipe the Combine that appear and blow up the explosive barrel so that you aren't on the receiving end of the explosion. Wait for the platform to reach you, pull the lever again, run out of the container and get onto the platform, and ride it as it rises and heads to the other end of the building. Kill the Combine as they appear and get off the platform when it stops. 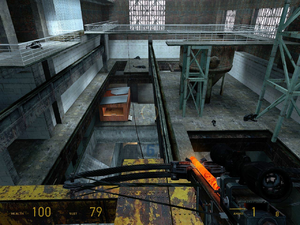 Climb the ladder on the tower to your left, walk across the white pipes and walk along the metal beams suspending the moving platform from before, killing the Combine who enters the red container below and sets the platform moving again. Follow the suspending beams under the walkway and round to the left before jumping the handrails onto the walkway. 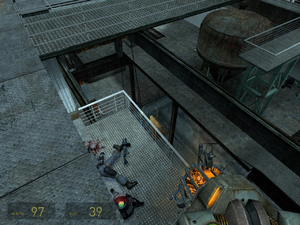 Follow the walkway back to the tower, climb the ladder one level, collect the supplies and walk along the narrow platform to the far side of the red container for a supply cache, killing the Combine that attack you. 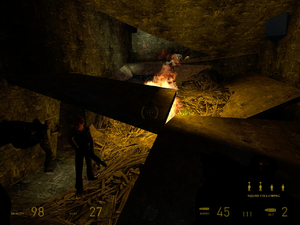 Go back to the tower and climb the ladder to the top level for the supplies by the explosive barrels. Two Combine will shoot at you from the far side of level below, so make sure you're not on the receiving end of any explosions. Head back down the ladder one level, follow the walkway to the other side with the red container (where the last two Combine were) and deal with the hopper mine on the level below. Drop down and go through the open blue double doors. Deal with the hopper mine at the bottom of the stairs, head down, go through the open doorway and down the hall to a loading screen for the next chapter - "Follow Freeman!" This page was last edited on 24 May 2013, at 16:39. This page has been accessed 28,875 times.